At 3,067 meters Ontake-san, also known as Kiso-ontake, is Japan’s second highest volcano. It was believed extinct for most of history, until it sprung back to life in 1979. As one of the traditional pilgrimage gateways for Mt. Ontake, Otaki’s connection to the sacred mountain is clearly intimate. While the mountain is revered by those who follow Ontake-kyo, the Ontake Faith, the villagers have a more familiar view. Former Otaki resident and anthropologist Eric Cunningham writes about how Ontake-san can be seen here and there from around the village, popping out from the clouds or around a corner like a child playing hide and seek. The villagers frequently refer to it as O-yama, something like Ms. Mountain. The presence of Ontake-san is always felt here, and when they speak about “living with nature,” they quite literally mean “with the mountain.” The villagers’ attitude to the mountain generally exhibits acceptance, respect, and gratitude. Sangaku-shinko, or “mountain devotion,” has a long history in Japan. You can hardly take a step in Japan without running into a mountain… Like many peoples, the ancient Japanese revered alpine realms as the meeting points of heaven and earth. Certain peaks, however, were considered particularly numinous. The mountain cults that developed in relation to them have always been important repositories of local Shinto and later esoteric Buddhist practice. There are dozens of these sacred peaks all over the country, but Ontake is in a realm of her own. For millennia, the mountain’s spirit has been welcomed to the rice fields in spring and returned to the heights in autumn with great celebration. As watershed source, she is the giver of life, as well as the great womb to which believers return when they die. She is for many a gateway, an underworld realm, and a kami [god] of multiple aspects all in one. As a sacred peak, mountain ascetics known as yamabushi considered Ontake-san an ideal training ground. They practiced Shugendo, an esoteric form of Shinto-Buddhist shamanism that reached its height in the middle ages. Pilgrimage on the mountain along with its rituals and purification practices was believed to endow practitioners with special powers, ultimately leading to enlightenment. For hundreds of years access to Mt. Ontake was restricted to the yamabushi. Before heading up the mountain, a 100-day period of purification was essential. The sacred waterfalls at the foot of Ontake-san were prime locations for austerities; in days gone by the caves and overhangs peppering the area would have sheltered ascetics who had retired there to fast, meditate, and merge with the mountain. Then, in 1792, a priest called Fukan opened the trail from Otaki to ordinary people, with a view to making the mountain’s powers more widely available. 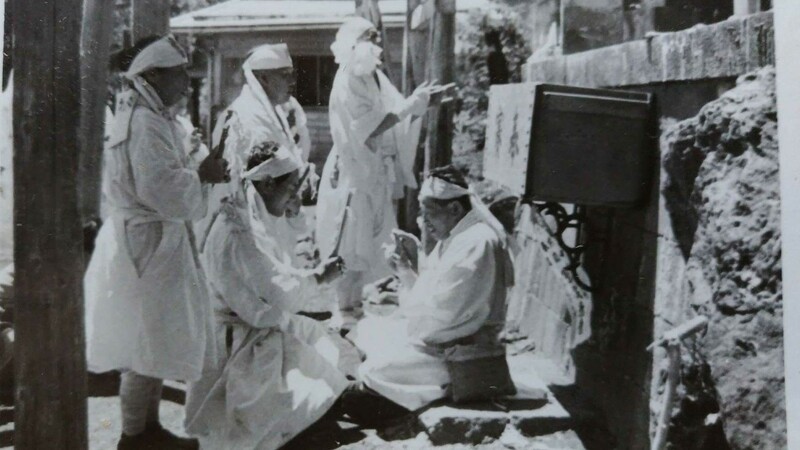 The arduous 100-day purification period was drastically reduced; in the following decades Ontake-san’s boons came to be associated with health, and faith in its healing power spread throughout Japan. This became Ontake-kyo, Mt. Ontake’s unique mountain faith, made up of bands of believers known as ko. In addition to periodic ceremonies and rituals at their home bases, the ko engaged in yearly journeys to Ontake-san, walking the Ontake Pilgrimage Trail to pray, purify themselves, and venerate the many sacred places along the way. This included communing with ko members in Ontake’s netherworld. When their leaders passed away, they were believed to become reijin, a kind of demi-god that returned to dwell in the mountain. The thousands of reijinhi that run along the pilgrimage trail mark where their spiritual energy resides. Every year, especially in August, the faithful still flock to Mt. Ontake from around the country. These days the austerities and rituals have been greatly reduced. Almost no one walks the whole trail: pilgrims come in buses from the cities and start the walk to the top from the 7th station at Ta-no-hara, after making a few ritual stops along the way. The summit forms a mandala of sorts, and the five crater lakes at the top include Ni-no-ike, the highest mountain lake in Japan. Visiting the sacred places on the summit is as important for pilgrims as the necessary rituals along the way. Since Ontake-san’s eruption in September 2014, the summit has been off limits. Visitors can proceed as far as the 9th station. That said, the volcano’s activity level is rated 1 by Japan’s Meteorological Agency, the lowest possible for an active volcano. We look forward to getting back to the summit soon!